"The projecting angle of the north wall forms the northern extremity of the city of Dublin, where the River Liffey enters. 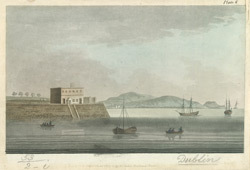 This view also exhibits the promontory of Howth, which forms the north entrance of Dublin Bay. The house, here represented, has been demolished and since the drawing was made, and is not yet rebuilt."